1. Part of the Mandi hoard, kept in the Treasury, Government of UP. 4. Hollow terminal beads, gold. 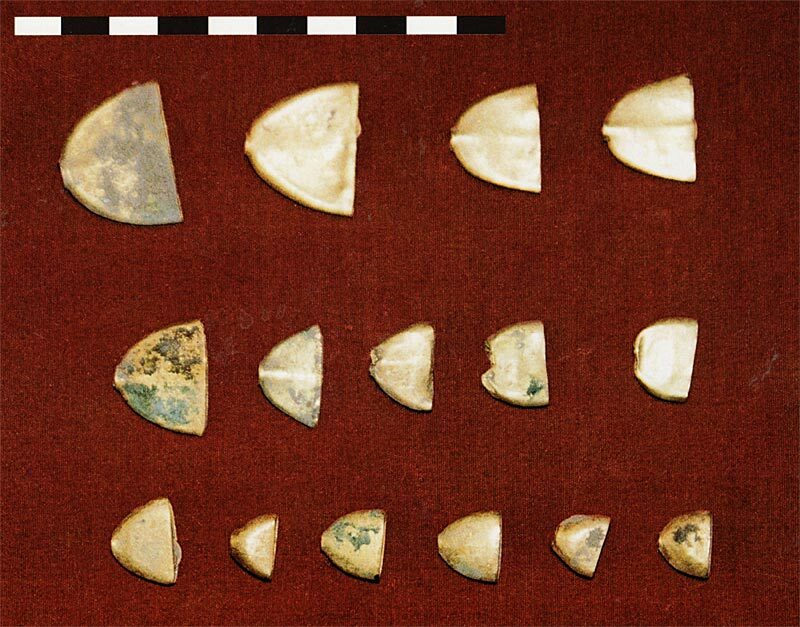 "The discovery of a rich hoard of Harappan jewelry from the village of Mandi (29-26 degrees 10' North, 77 degrees 34-35'E) in Muzzaffarnagar district, western Uttar Pradesh, has surprised the archaeological world for several reasons. First, Mandi is located to the east of the Yamuna river, and this area has been considered peripheral to the main distribution area of the Harappan civilization. Second, the sheer quantity of the jewellery recovered from the site makes it the largest hoard of ancient jewellry ever found in India, if not the entire subcontinent. About 10 kilograms of this jewellery has so far reached the government," writes Rakesh Tiwari. 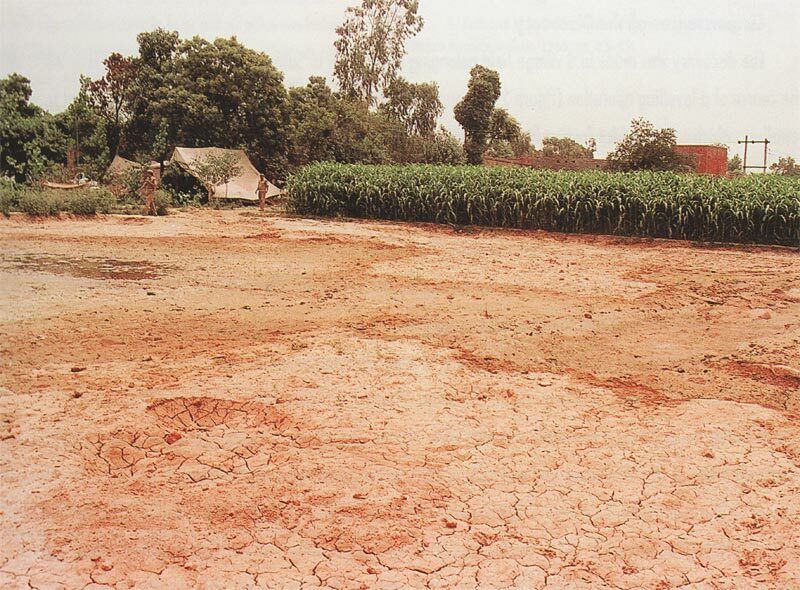 "The discovery was made in a village field belonging to Anil, son of Satpat Jat in the last week of May 2000 in the course of a levelling operation (5). When the villagers learnt of the discovery, they began a hunt for more jewellery, which continued for four or five days and led to fights. Meanwhile, news of this discovery reached the Circle Officer (CO) of Police, Sadar, on June 1 through an informer. He directed a team from the Titavi police station to make inquiries of Mandi. The police found the villagers still fighting among themselves for jewellery at the site. One villager was arrested; the others ran away. Thereafter, the police collected pieces of jewellery mixed with soil from the site, and kept the cache sealed for the night. The CO and the Sub-divisional Magistrate reached the spot on June 2 to verify the facts and found a large crowd gathered there, a few still searching through the soil. On their arrival the crowd gradually dispersed . . .. Subsequently, the DM, Muzzaffarnagar gave ninety percent of the material kept at the treasury to the ASI [Archaeological Survey of India] and to the State Museum, Lucknow." "The material kept in the treasury consists of two copper containers, and a large number of beads made of gold, banded agate, onyx and copper (1). One of the containers is a large bowl with convex sides and flat base. Its radius is about 21 centimetres and its internal and external depths are 14.8 and 15.3 centimetres respectively. The second container is rectangular in shape, 47.5, 9.5, and 4.5 centimetres in length, width, and inner depth respectively. The gold beads are of four types - spacer beads, hollow terminal beads, single and double bell-shaped beads, and paper thin circular beads. 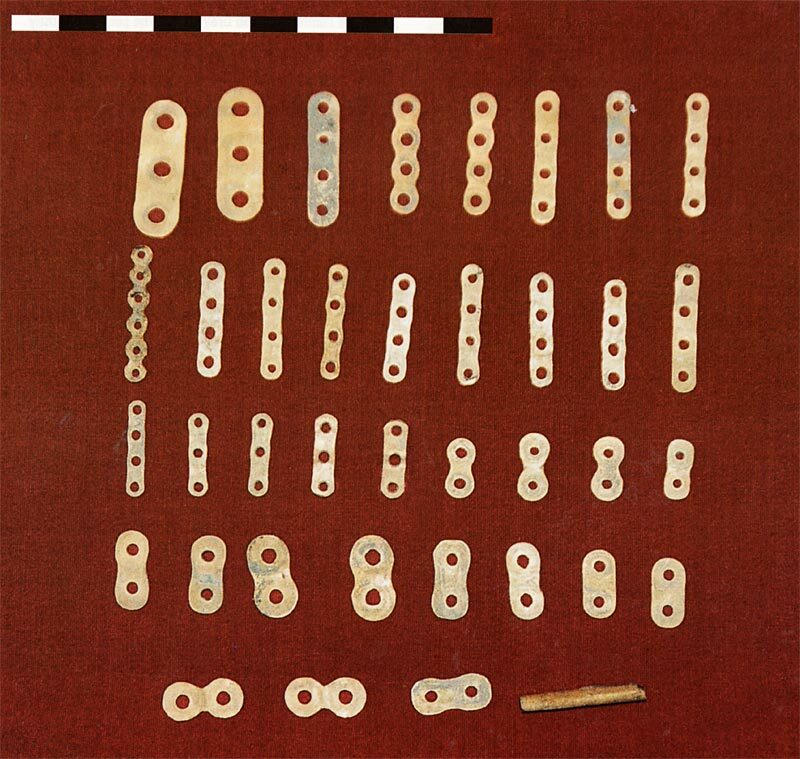 Space beads with either straight or segmented sides are of different sizes: 3 x 1, 3 x 0.5, 2.5 x 0.5, and 1.8 x 0.4 centimetres (2). On the basis of the number of holes they possess, these beads may be further divided into four sub-groups. Seventeen beads have been found with two holes, four with three holes, fifteen with four holes, and one with six holes. Hollow terminal beads are presented by eighteen specimens (4). Their measurements vary between 3 x 2 and 2.2 x 1.9 centimetres. 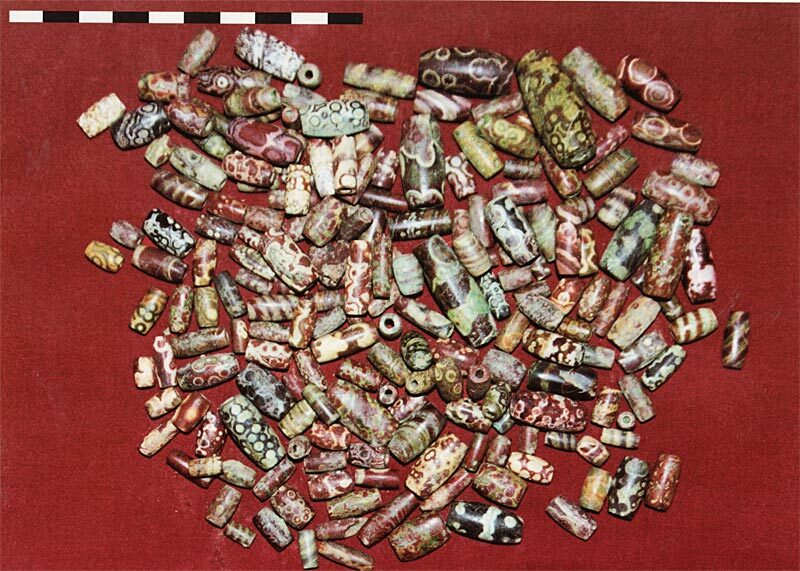 Two beads of a particular size were possibly meant to be used in one necklace, so these eighteen hollow terminal beads indicate nine necklaces. . ..
Beads from the Mandi hoard are comparable to those from various sites of the Harappan civilization." 5. 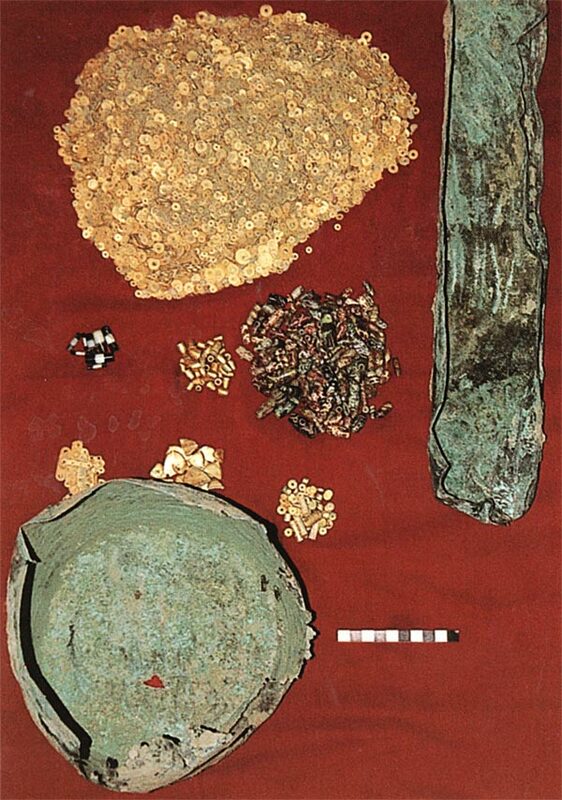 General View of the findspot of the Mandi hoard. (Rakesh Tilwari, A Recently Discovered Hoard of Harappan Jewelry from Western Uttar Pradesh in Indus Civilization Site in India New Discoveries (2004), Ed. Dilip K. Chakrabarti, pp. 57-63. Photographs courtesy UP State Archaeology Department.